Well, the good news, as I survey the neighborhood on the day after is that we survived. Boston had its moments with more than a quarter million homes without power, but it is nothing compared to the reality of New York City and environs. We were relatively lucky on this one. 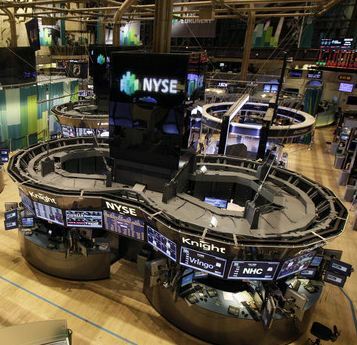 We stress that, as of now, there has been no damage to the NYSE Euronext NYC headquarters that would impair trading floor operations,” exchange officials said in a notice to traders. Perhaps the data centers where all the clearing goes on were not as fortunate? The article goes on to discuss contingency plans. Whatever. Maybe the exchange has done a bang-up job of contingency planning for just such an event or maybe it was looking forward to the complete melting of the ice caps. Whatever happened, and for whatever reason, the exchange is not operating today. Hurricane Sandy has provided a vivid demonstration to many powerful interests of the greater power of nature and it has reminded us that no one is immune to nature’s fury. – Those who believe global warming is happening are more certain than those who do not. Over half of Americans who believe global warming is happening (57%) say they are “very” (30%) or “extremely sure” (27%). – For the first time since 2008, more than half of Americans (54%) believe global warming is caused mostly by human activities. The proportion of Americans who say it is caused mostly by natural changes in the environment has declined to 30%. – A growing number of Americans believe global warming is already harming people both at home and abroad. Four in 10 say people around the world are being harmed right now by climate change, while 36% say global warming is currently harming people in the United States. Interestingly, the 57% who said they believed in global warming is a rebound number. It was as high as 71% in 2008 just before the financial meltdown. If there is a silver lining to any of this, and you might need to have a pretty tough exterior to say or believe this, it might be a changed attitude in the ranks of the Masters of the Universe especially the climate change deniers who would have much to say about taking effective action because it costs money. There are two ways to take such effective action. One is to build a dyke around your property and insulate yourself from the worst effects of another once in a century storm. The other is to take systemic action to cure or at least mitigate the worst effects of climate change for the planet. Now that Wall Street is closed for another day, just as a precaution you see, perhaps powerful people will take a moment to reflect on their positions.